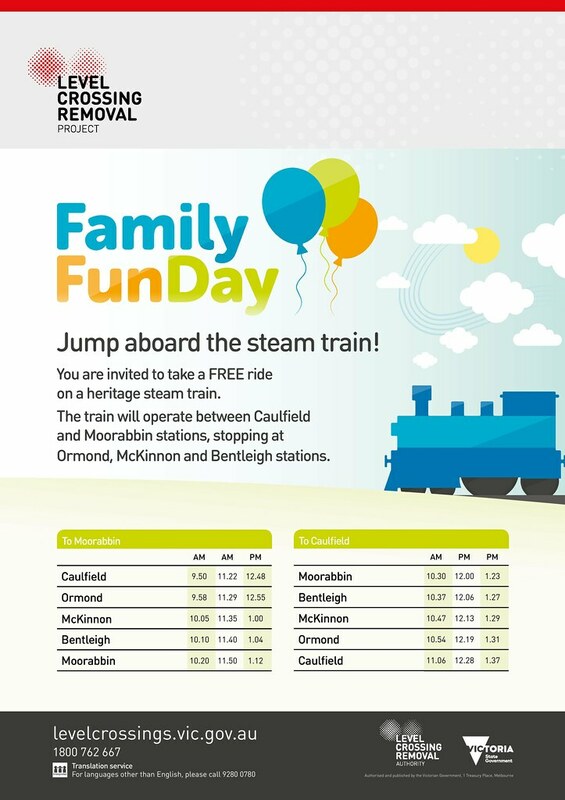 This coming Saturday the new Bentleigh, McKinnon and Ormond stations are hosting a “family fun day” featuring a steam train. Should be… well, fun. At Ormond the entrance on the northern side of the road has recently opened. This is really helpful given North Road is a big arterial road, with some six lanes of traffic at 60 kmh. That’s not so important at Bentleigh and McKinnon; only two lanes of traffic (at 40 or 50 kmh), and we’re getting pedestrian lights instead… which hopefully will be programmed to be very responsive to pedestrians. 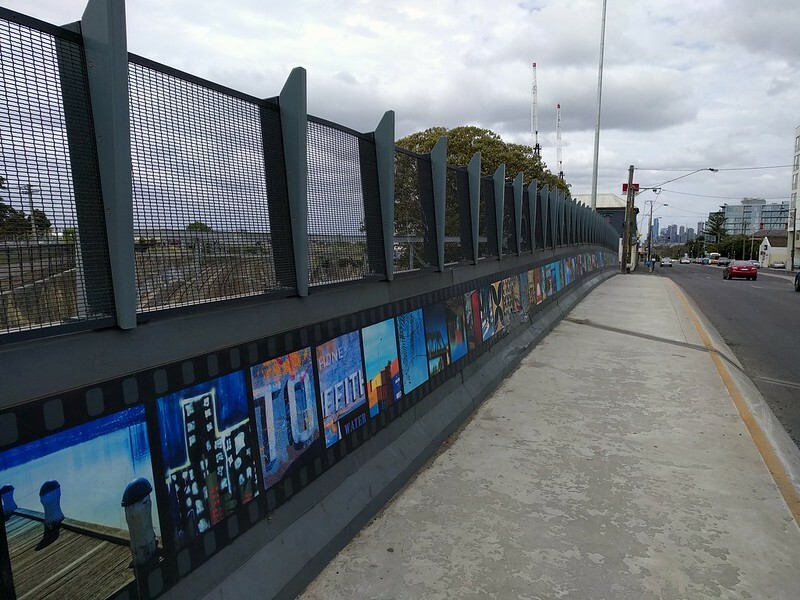 The Level Crossing Removal Authority is calling for artists to decorate the concrete walls. As with nearby Patterson station mural, hopefully this will help beautify the grey concrete, and prevent it being covered in graffiti. Or advertising, for that matter. Many around Australia would know of the Gosford Anglican Church, thanks to Father Rod Bower and his famous signs. A couple of weeks ago this sign appeared at the Bentleigh Uniting Church. It now seems to have disappeared in favour their more usual list of events. It pleases me to see messages like this. Immigration, and the mandatory detention of refugees, is a difficult issue. I’m not going to pretend that I know of a simple answer that both treats people humanely and deters and prevents drownings at sea, but the current position of taking desperate people, locking them up off-shore at arms length from Australian law and responsibility, often ignoring concerns, and particularly the secrecy involved, is something that troubles me greatly. Right now we as a nation are trying to put past crimes, such as church sexual abuse, in the spotlight. I wonder if in decades to come we’ll be regretting and investigating our current treatment of asylum seekers in a similar way. I hope the sign got a few people thinking more about this issue, and possible solutions. 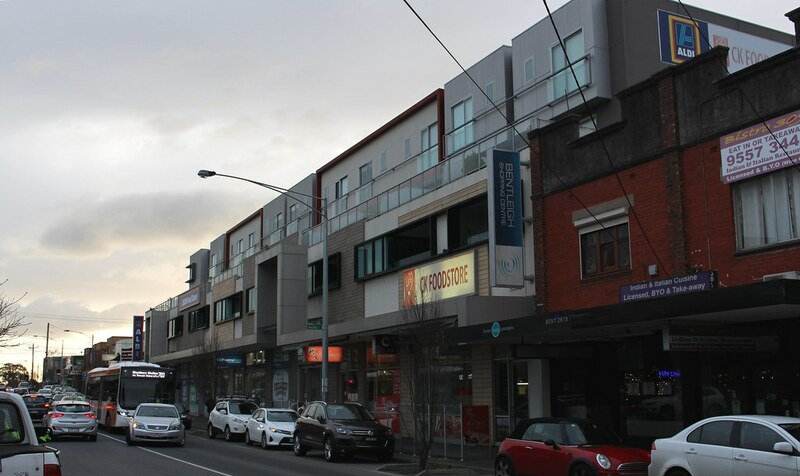 My local suburb is increasing in density, and (not entirely disconnected from that) it’s also interesting to see how the retail strip is doing. The shopping centre has grown around the railway station, which is still the epicentre, though the east side of the tracks is where most of the busiest shops are located. The chain stores (often referred to as “anchor tenants”) have maintained their presence here, and in fact new ones are moving in. The three big supermarkets Coles, Woolworths and Aldi have branches. No IGA though – there is one in nearby East Bentleigh. Medicare was here until last year; it’s now closed. 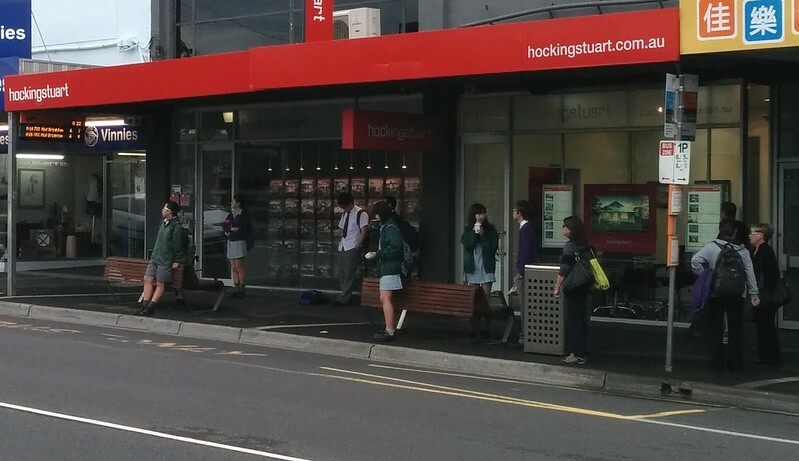 But there is a post office and dealers for Telstra and Vodafone. Real estate agent offices abound: chains include Woodards, Buxton, Hocking Stuart, Hodges, Century 21. And food giant of the moment Domino’s pizza, as well as Crust Pizza and Nandos chicken and Subway are all here, though other fast food outlets such as Maccas, KFC and Hungry Jack’s seem to prefer to be on the highways or major arterial roads. All these chains sit alongside hundreds of individual retailers, who while they might compete, are probably glad that the chains are there to bring in the shoppers. The newest chain store arrivals are Mexican restaurant Taco Bill’s and Chemist Warehouse, the latter taking up residence just a couple of doors from Priceline… they must be delighted. I suspect restaurants benefit from more local competition, growing the local market of diners. I’m not sure the same can be said for chemists. 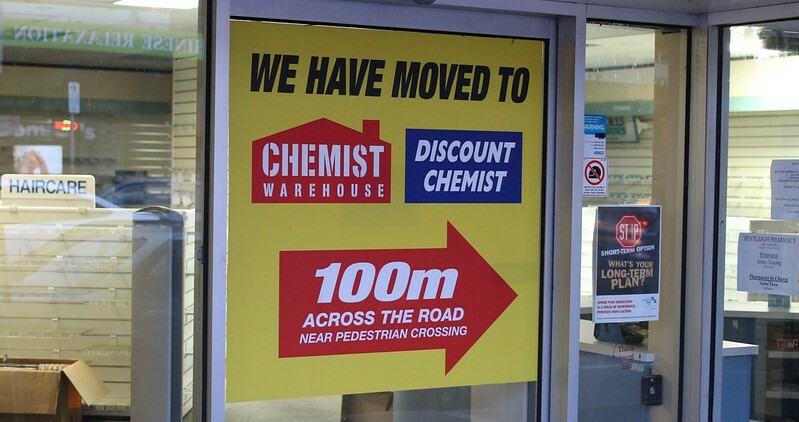 Despite the utilitarian warehouse design of Chemist Warehouse (well, it is in the name), I don’t mind them — though I’m always amused by their advertising. “Australia’s Cheapest Chemist” it proclaims, but if you look closely it actually says “Is this?” in front of that. So technically they’re not making the claim, they’re asking the question. Hmmmmmmm. 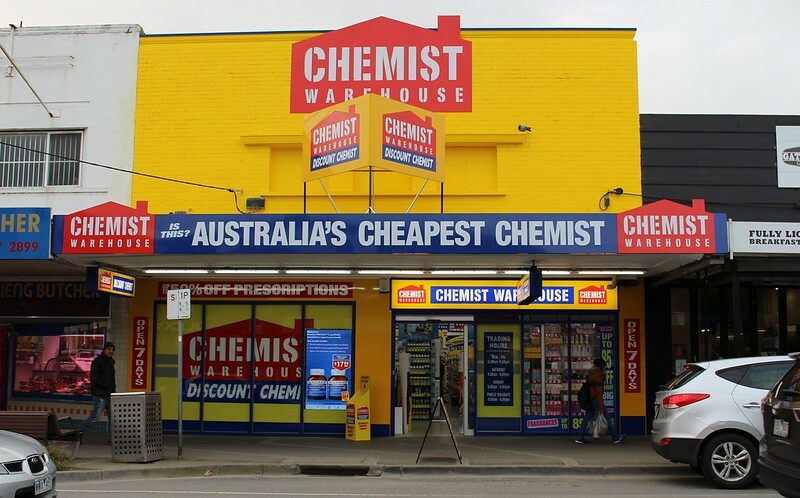 It turns out Chemist Warehouse is not a new pharmacy — it’s a moved and rebranded one. Perhaps not a surprise – the Pharmacy Guild has strict location rules preventing too many chemists in one area. That aside, rebranding is a clever move. I rarely saw anybody go into the old chemist. The new one has brand recognition and more promotion — and already, from what I’ve seen, is getting a lot more customers. I guess that’s the advantages of being part of a chain. Other rail-based suburbs I’ve lived in, such as Murrumbeena and Glen Huntly, may not have the benefits of lots of chains, but it’s pleasing to see them still getting customers in, thanks to things like quality local cafes. Hopefully all these local centres will continue to thrive. They’re so much more interesting than the malls. With Ormond likely to get its tower (whatever the height might be), what of other nearby suburbs? 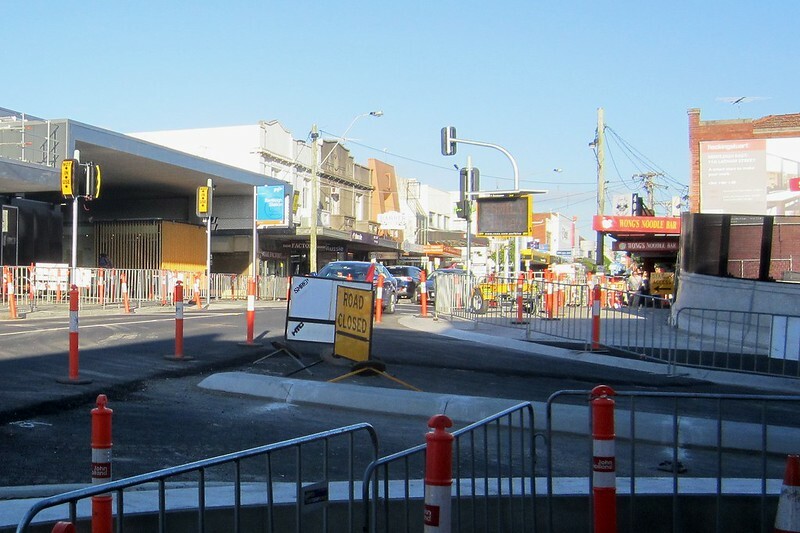 The transition is already underway in Bentleigh and many other areas. Around the station, numerous developments are going up. And in principle, I have no problem with this. 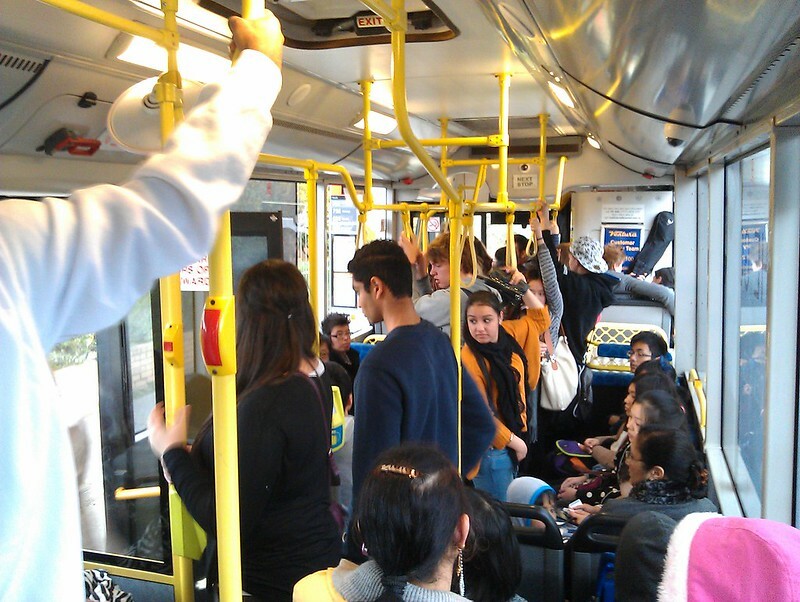 Melbourne’s population continues to grow. People have to live somewhere, and placing them close to jobs and services and infrastructure is better than having our city continue to sprawl. Close to the shopping centre and the station and bus routes is the best place for this, to increase the chances of people being able to walk to what they need. Buildings along the main street (Centre Road) in particular make sense. Car parks behind the shops provide a buffer that can help prevent shadowing onto single storey homes. 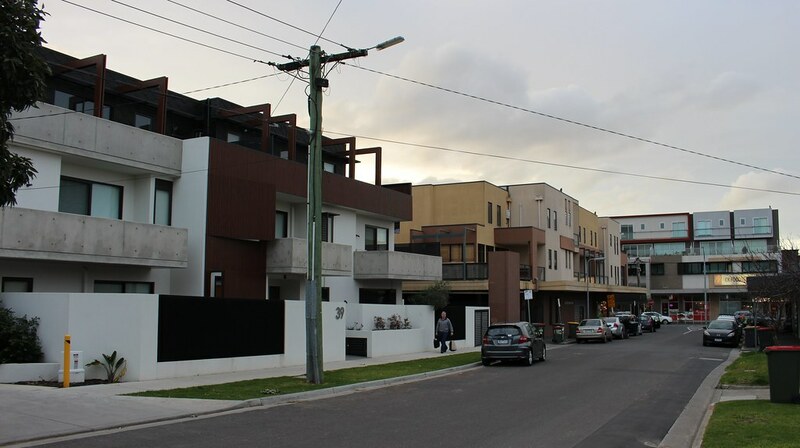 The residential zones introduced a couple of years ago mean this is spreading to nearby streets. But heights are staggered as you move away from the station, so it seems workable to me. Here’s how it looks in Bentleigh. 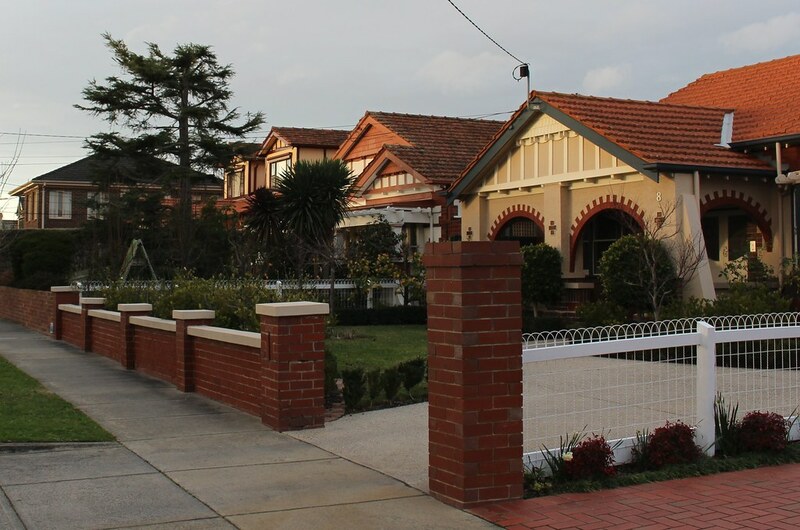 Bentleigh has had densification of various types over the years. 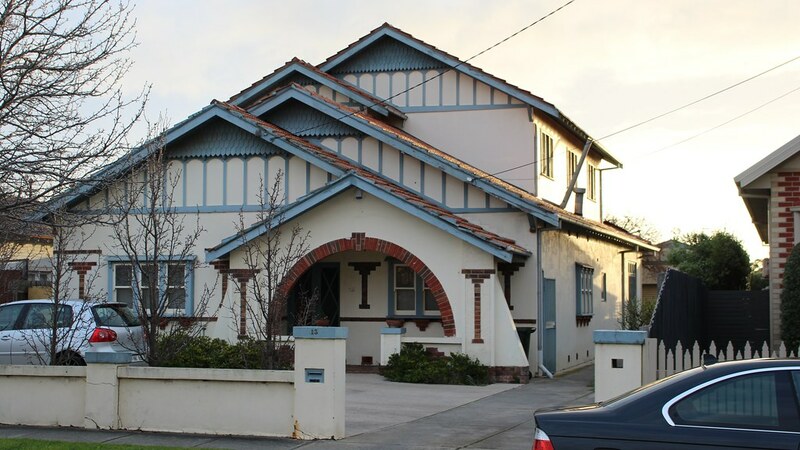 In the 70s and 80s, some blocks of flats went up, mostly 2 storeys, many of which are still around today — though nowhere near the numbers you see in inner suburbs like St Kilda. Since the 90s there has been a lot of subdividing. Back yards have shrunk, with either new houses being built behind old ones (this is the case behind my old house) or houses being removed and replaced with 2-3 homes, typically semi-detached townhouses. Meanwhile a lot of homes have had extensions, increasing capacity but not necessarily occupancy. Buildings are bigger closer to the station. 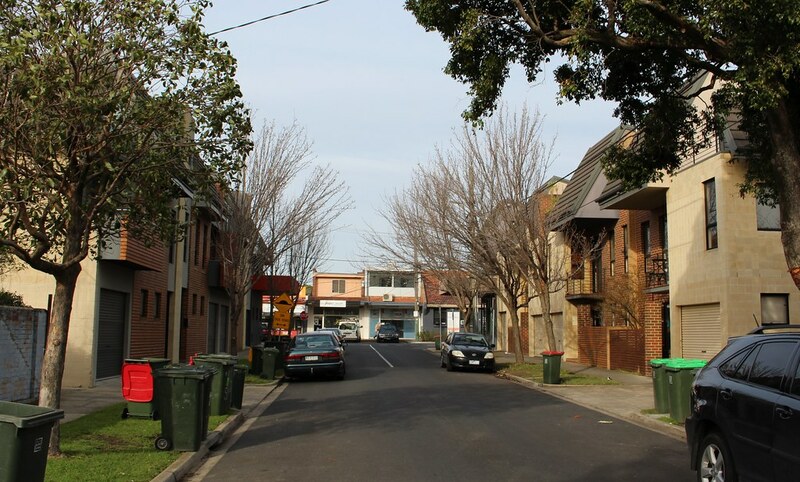 Below you can see the main street, Centre Road, a retail and residential building about five years old. It’s big, but you barely notice it at street level if you’re walking around looking at the shops. If it built were today, I’d be surprised if they didn’t aim higher. 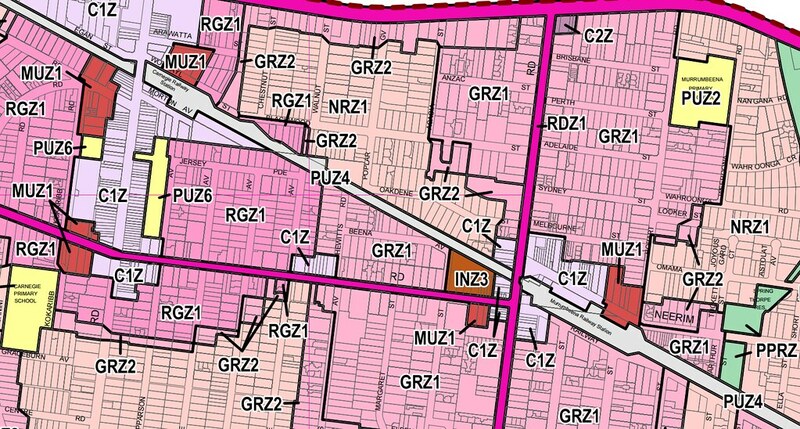 The zones above, introduced a couple of years have triggered a lot more apartment developments off Centre Road. Below is Mavho Street (3 storey limit on the west side), looking towards the Aldi building pictured above. 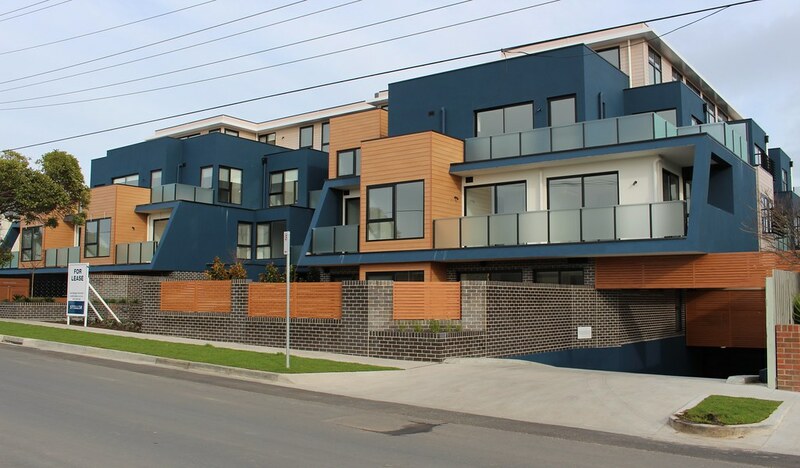 Lorrane Street: This one has just been completed. It’s not really a surprise that all the recent and current developments go right up to their zone’s height limit. Bent Street: It’s not hard to anticipate that many of the homes in the RGZ1 4 storey zone will be re-developed in this way in coming years. Clearly some home owners have seen the writing (and the dollar signs?) on the wall. At the southern end of Bentleigh (near Patterson Station), and also in Mckinnon, there’s been development around the shopping centre. Despite the garage doors facing onto the street (not ideal for pedestrians), I find the scale and look of these homes quite appealing. 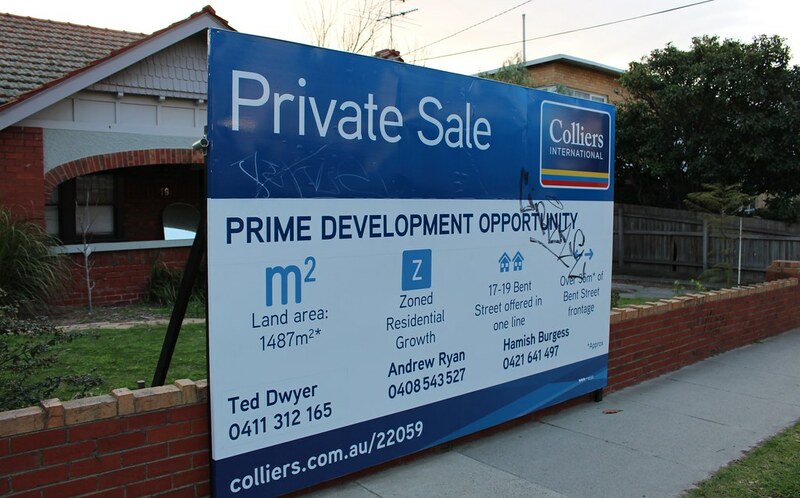 With my local resident hat on, I would like the benefits of my suburb to be available to more people, so I see nothing wrong with this, provided designs are good, nobody is forced out, and anybody who does sell up to developers is doing well out of the transaction. If anything, I think the 3-4 storey limits should be allowed a little further from the station. Of course there are many lovely older homes that should be preserved. Height limits across most of the area (away from the station) can help with this, but inevitably won’t save them all. As I said above, it makes sense to increase urban density in areas with good access to services and infrastructure. It’s good to see it happening. 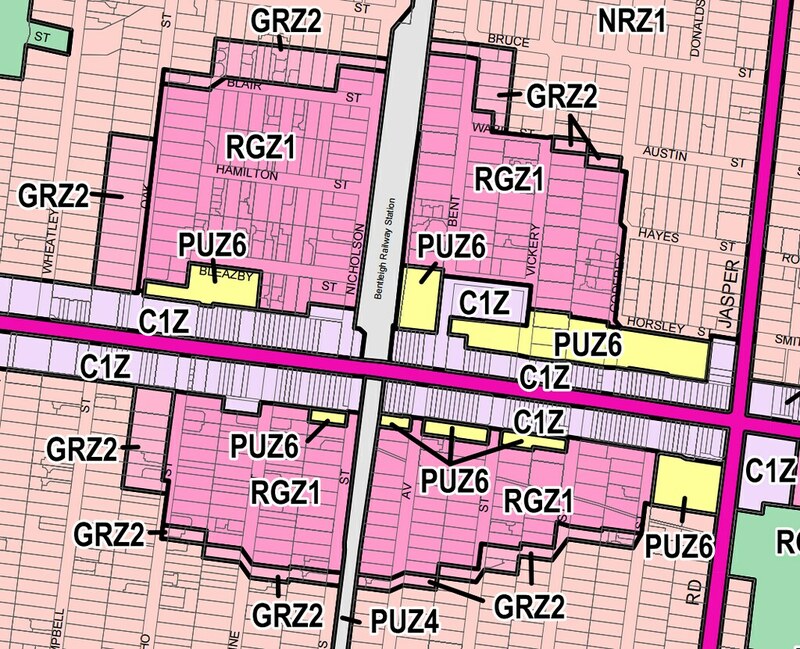 Also worth looking at: the area around Carnegie and Murrumbeena. 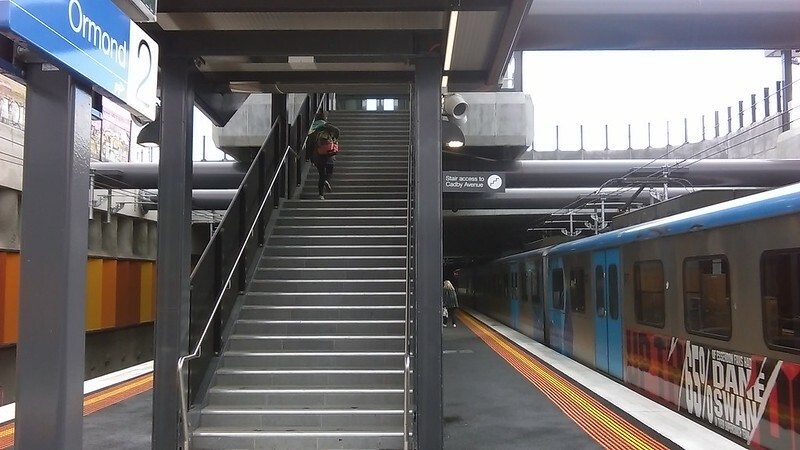 This is particularly interesting in the context of the skyrail debate; most of the areas alongside the rail line have 3-4 storeys permitted (higher immediately around the stations), though when and if this occurs of course, nobody knows. How is it in your neighbourhood? It’s worth finding out, especially if you’re planning on buying, and/or living there for a while. 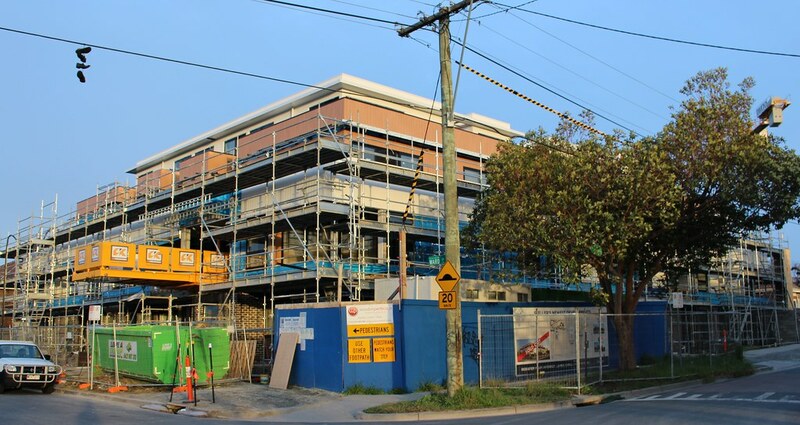 Update 22/12/2016: This Age comment piece from Clay Lucas notes development in Bent Street and around the local area.